A decade ago, on February 16, 2007, pop princess Britney Spears entered Esther’s hair salon in California and asked the owner to shave her head. After having a few complicated years in her personal life (failed marriages, losing the custody of her sons, perpetual harassment from the paparazzi, drugs and alcohol addiction), the world watched through the eye of the media as Spears‘ downward spiral reached its darkest depths. After a decade of ups and downs, she can now say that in both her career and her personal life that she is finally “loving herself” (as she did to People Magazine). But how has our vision of mental health changed in the last 10 years? For many people, there is still a lot of stigma and ignorance around depression and anxiety. Do we show artists enough empathy? Considered by many to be privileged rich people who should have nothing to complain about, do we really take them seriously when they are addressing these issues? In 2017, mental illness is still glorified or, at least, a subject to laugh about. From Beethoven to Elliot Smith, depression and anxiety have been seen as natural fuel for creativity. The legend of the “tortured genius” is deeply present in the minds of too many of us, as pain and creativity are considered related. The suicides of Kurt Cobain, singer of Nirvana or Ian Curtis, singer of Joy Division, are a source of fantasy for their fans, as depression is an inherent part of their legacy in music. There is never one single reason that a person develops mental health issues, but more a mixture of conditions that can come from strenuous working conditions: precarity for most of them, intense touring, the pressure of coming up with new material, isolation, anti-social hours, problems connected to both your loved ones and new people, as well as the easy access to alcohol and drugs (legal or not). Many artists have refused the touring life entirely, as with Britney herself, who seems more than happy to focus on her “Piece Of Me” Residency in Las Vegas. Adele also declared, just after releasing her album “25”, that she will not be touring for “another ten years” to focus on her personal life. But the truth is that, for most musicians, not touring isn’t really an option, as selling records is no longer a viable way to sustain a career. According to a study published by Help Musicians UK, based on a survey of over 2,000 musicians, live crew members, music management staff and music producers, amongst others, 71% of them have declared to have suffered from depression and panic attacks during their careers. By comparison, 19% of the general population declares the same thing. Not only did the study focus on mental issues, but also on the more physical issues involved in a musical career. The history of eating disorders among artists is long, ranging from female pop artists such as Lady Gaga, who opened up about her struggles with bulimia and anorexia since the age of 15, and the body shaming since she started her career, or Kesha, who recently revealed the harassment she suffered from Dr. Luke due to her weight, to male artists like Years & Years‘ singer Olly Alexander or former 1 Direction singer Zayn who recently addressed their long struggles. It’s hard right now. I can’t stand social media, I can’t stand what they’re looking at. I can’t stand what they think is reality, and [this] show is real as it could possibly get. Unfortunately, kids don’t care. They don’t care, they have to see something that’s going to scare them. They need to see something that’s frightening…I want them to understand it. I would do anything to be able to have a good influence on this generation, but I definitely relate to everything that was going on. I was there for the last episode, and I was a mess just seeing it all come to life, because I’ve experienced that. Another way to connect more with their fans is by sharing what can be considered a common experience. After being very present on Tumblr, Halsey spoke about her own struggles as a teenager in an interview for Billboard, where she discussed being diagnosed with bipolar disorder and attempting suicide at the age of 15. Talking about these issues can help other artists to exorcize the issue and prevent some fans from going through the same dark phase. As suicide is the third leading cause of death among 10-14 and second among 15-34, according to a study, high-profile artists who discuss their mental illness help by raising awareness and educating through the veil of misinformation. Young men are the group most likely to commit suicide, especially those under the age of 35. Many specialists describe it as the “silent epidemic” as suicide is the most common way for a man between the age of 15 and 34 to die. Minorities are also more likely to suffer from depression, often without easy access to treatment; one study found that “Depression diagnosis rates were 6.4% for non-Hispanic Whites, 4.2% for African Americans, 7.2% for Hispanics, and 3.8% for others”. In October of last year, Kid Cudi addressed his decision to check himself into rehab for “depression and suicidal urges,” on Facebook, leading to commotion amongst his fans. As it seems harder for men, especially black men, to discuss this issue, the statement went some way to opening the dialogue up on issues on the intersection of race, depression and masculinity. At the end of last year, we learnt that Kanye West had been hospitalized for stress and exhaustion. Many fans declared that they saw it coming due to the rapper’s notoriously unpredictable, confusing and, let’s say it, crazy personality. Kanye could easily fit the mould of a modern “tortured genius”. His status as a big star turned him into an easy target for mockery, however many of his friends reached out in support. During a BBC Live performance, Chance The Rapper said: “I want to extend a very special prayer to my big brother Kanye West… extend this love” showing how the world can have very different perceptions of mental illness. Others have chosen to deal with depression throughout their art, creating an open artistic space for black men. Kendrick Lamar on his critically-acclaimed album, “To Pimp A Butterfly,” managed to raise awareness of the issue of mental illness in hip-hop, a genre where the issue is rarely spoken about. On his track “U,” he addresses the subject as a way to get him cleaned of all of the negative energy, his album being his escape to exorcize his problems. In an interview with 93.7 The Beat, the artist declared “The record feels great but it comes from a place of depression. It comes from a place of insecurity. (Depression) is something I faced in my life not only when (writing about the song), but even now. As many artists and fans seem both ready to discuss the issue, what are the concrete solutions offered? CALM (Campaign Against Living Miserably) is a charity that helps prevent male suicide. Last year, they launched TORCH SONGS, a campaign to raise awareness in the music industry by offering artists a platform to share their battles against depression and anxiety and how music has helped them overcome it. They also encourage fans to share their own experiences via the hashtag #whatsyourtorchsong, as many men have troubles putting words into their uneasiness. 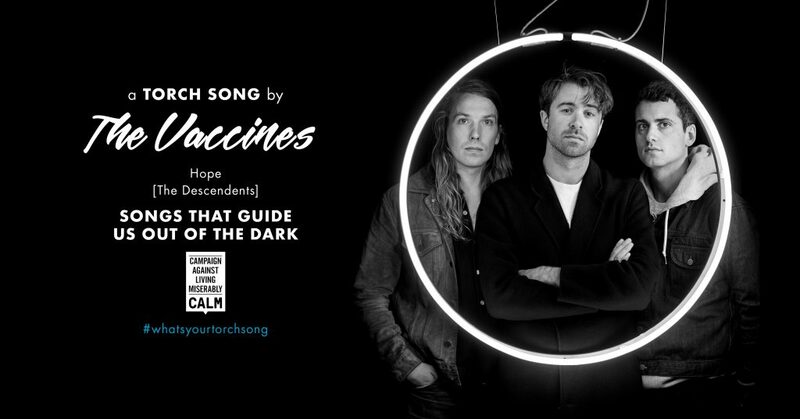 Described as “songs that guide us out of the dark,” the campaign counted Olly Alexander of Years & Years, Justin Young of The Vaccines, Ben Gregory of Blaenavon and Frank Turner as their ambassadors. After all of the efforts made by artists to address their issues, the public eye towards mental illness has shifted, fans showing more compassion and sympathy. The growing discussion around music and mental health shouldn’t be exclusively around artists but also around the entire music scene, going from producers, sound engineers to tour managers, PRs, etc. as they face the same difficulties as those on stage, ranging from income instability to exhaustion. The music industry is starting to open the gate, but the concrete changes are yet to come. When it comes to the fans, the awareness has shown the first symptoms of improvement as the public doesn’t hesitate to defend artists when mocked. Most recently, during the Grammy Awards’ red carpet, Ryan Seacrest asked artist Katy Perry about her time off. Her response was nothing more than a petty comment against Britney Spears infamous breakdown as she replied to how she was feeling: “Fantastic. And I haven’t shaved my head yet.” Via the hashtag #KatyPerryIsOverParty, fans are calling out the “Teenage Dream” artist about her lack of empathy towards mental health in the music industry. We, as a public, are ready to make no joke about stars struggling with depression and to defend them, when they are attacked. The best response remains the one given by Britney Spears who quoted a Bible verse on her Twitter account, showing not only that she is feeling better, but that she feels strong enough to defend herself. You can listen a playlist below, where you will find 20 songs that deal with depression, anxiety and unrequited love.